I've had a couple rough weeks, my kids and husband have been getting sick on and off. I've been stuck at home a lot and really overwhelmed. I might be a little vitamin D deficient too. I've just been down. Last week my friend Jess blogged about a sign she made HERE. The saying really struck a cord with me. I realized it had been weeks since I've sewed or created anything. The joy I have when I create really helps me through rough patches. The next day I decided I better get going on my daughter's birthday present. Her birthday isn't till the end of next month but I was hoping to make three sets of matching outfits for her new bitty baby twins. My sister found the most amazing deal on a brand new set still in the box. The only problem was that they were naked. The person selling them had only bought them for their clothes. I've got one outfit done. Consider this a sneak peak since I hope to show you five more outfits and the dolls in a month. When I was done I felt so much better. Since then I've started on a couple more projects, I'll be showing you soon. I don't know if you are one of those people who just struggle January and February, but if you are, I encourage you to create. It may mend your soul too. I know I'm one of those people! Even though the sun's been shining, I've been bogged down and not able to get outside much. I started feeling restless and overwhelmed, and then realized I hadn't made anything for awhile. Art mends the soul too! The dress is adorable! I'm sure your daughter will LOVE them! That saying is so true! Cute dolly clothes!! When my third was born, I discovered that creating was an absolute necessity. I drink too much coffee and stay up late at night to sew or craft, just so I can feel like a real person. Gets me through the day to know that I can do some soul mending after the kids are in bed. Hope everyone is well and spring is here soon! I love that saying! Following the arrival of my daughter, who was stillborn in May, I put my sewing machine away because I was making her bedding and couldn't stand the thought of sewing anything that wasn't for her. In August, my husband encouraged me to start sewing again as a stress release since I was upset about all of my friends starting another school year when I wasn't (I previously taught 1st grade, but had resigned to stay home with my daughter). He now jokingly calls crafting my "sewing therapy" as I am a much happier person when I am sewing. Agreed. I've been in the same boat. Sewing soothes me, too. Sunshine is a pretty amazing thing for my mood so I totally understand. I never thought of my crafts as a substitute, but yeah, it kind of works the same way. Great post! Hope everyone feels well soon. That is such a cute bitty baby outfit! Yes, I get the winter blues right about this time. We are having unseasonably warm weather this week, and today I got to go outside and feel the sunshine on my face - I can't wait for spring! Well I so know what you mean about Jaunary/February fatigue. 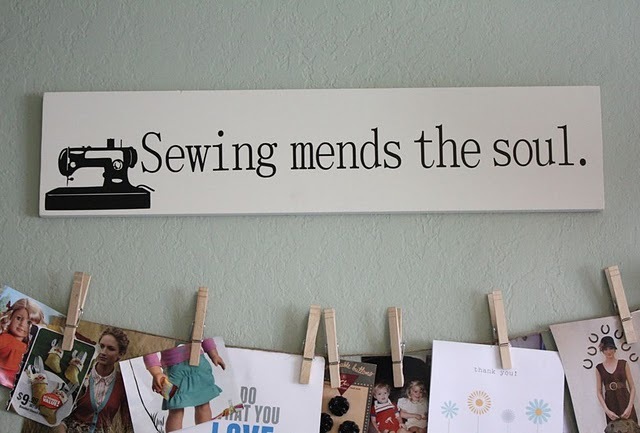 Yes sewing keeps us together and calm. Keep up the good blog work. I'm so glad sewing lifted your spirits! And I am totally the same way-if it's been awhile I get grumpy-and yay for making doll clothes! That dress is Adorable! love that you are making clothes for her bitty babies. Great birthday present. I struggle every year with the first few months of a new year. I don't know if its the let down of the holiday season being over or just the dreary that comes with the weather. This year I started blogging with the new year and it has made a world of difference. I have crafted just for me. Crafted for the sole purpose of crafting, not for creating with the purpose to sale. It has made a world of difference. Keep crafting. Winter is a killer for me, too. I've been losing myself daily in what I call fabric therapy. Color and texture and print and creation - it's a beautiful combination to lift the spirits!